Located on the Atlantic coast, the surrounding farm is built by the sea on the historic ruins of Nova Scotia, Canada. This house was built within structures called Shobac Cottages. Enough House is the tenth structure that was added to the area. It’s made out of a Cor-Ten exterior to guard it against the harsh weather. Inside, Enough House has a plywood interior. Overall, the architects wanted to show off space, budget, schedule, and aesthetic. Simple and basic-looking from the outside, the minimalistic design of the Enough House belies the comfort and warmth of its interiors. Enough House is the newest addition to architect Brian MacKay-Lyons’ Shobac farm in Nova Scotia. 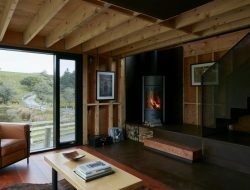 The property overlooks the Atlantic Ocean and acts as both the satellite rural studio for Mackay-Lyons Sweetapple Architects and as an architectural testing ground. For almost 30 years, MacKay-Lyons has used the cliff-side site to explore ideas of form, materiality, and building in the landscape. The campus mixes old and new, as reclaimed historic buildings sit next to modern structures unified by their palette. The latest addition, Enough House, provides accommodation for an intern architect to work closely with MacKay-Lyons. The cabin is an essay in the economy: space, budget, schedule and aesthetic. It shares the same minimalist ethic as the adjacent, 1830’s schoolhouse. But whereas the schoolhouse is classical and an essay in wood detailing, Enough House is developed from materiality that is thoroughly contemporary: all Corten outside and many rusted steel totems inside. It’s exposed Douglas fir plywood sheathing, the wide stained pine floorboards and the plywood cabinetry match the rusted palette, giving the building a monolithic effect. Enough House’s simple form recalls the archetypal child’s image of a house. It was partially inspired by the residence of Canadian folk artist Maud Lewis, where MacKay-Lyons played as a child. Lewis lived in a simple structure that consisted of a bedroom upstairs and a single room downstairs with a stove, stairs and a window to paint beside. Enough House is similarly restrained in terms of programming, with a living space, kitchen, and two bedrooms. If this small house grabbed your interest, check out this small residence in Hawthorn.